Construction company Dawnus has gone into administration, according to subcontractors. 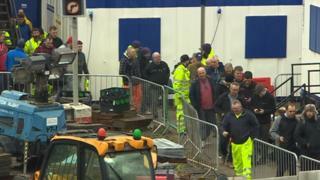 People who work for the Swansea-based firm were called to a meeting on Thursday morning. But they were sent home afterwards, and could be seen removing tools from the site. It comes after work on the £12m Kingsway redevelopment in Swansea and a road project in Manchester were both halted. Three school building projects in Powys could also be delayed, including one which is scheduled for completion in September. Dawnus – which runs construction projects across the UK and overseas – has been contacted repeatedly by the BBC but has not commented. However, people leaving the Swansea meeting said they had been told the firm had gone into administration. On Tuesday, diggers were abandoned on the £15m Manchester-Salford Inner Relief Route improvement scheme, which is upgrading six major junctions along Regent Road. It caused widespread disruption, with the equipment blocking the key route. Workers claimed they had not been paid by Dawnus Ltd. The following day, workers in Swansea were sent home by their bosses. A spokesperson for the Manchester-Salford Inner Relief Road scheme, which is being carried out jointly by Manchester and Salford city councils, said it was seeking “urgent clarification” about the status of Dawnus. “We are currently pursuing all other options to ensure the project can continue as quickly as possible,” they added. “City council staff and other contractors are currently on site to ensure it remains safe and secure following high winds overnight. Dawnus has its headquarters in Swansea but runs construction projects across the UK and overseas. The most recent company accounts show the company had a turnover of £170m in 2017, but it also posted a pre-tax loss of £1.35m. However last September, the company said it employed 700 people and was optimistic about the future. Among its past projects across the UK are the Great Western Air Ambulance Charity and National Police Air Service Air Operations in South Gloucestershire, a creative industries centre at Kingston College in London , and South Wokingham Secondary School in Berkshire. Dawnus has previously operated in Liberia and Senegal in west Africa. In August, during a UK trade mission to South Africa attended by Prime Minister Theresa May, Dawnus was unveiled as part of a consortium targeting oversea aid contracts. The company told BBC Wales in September that they felt optimistic about life after Brexit because of the opportunities for overseas work. Dawnus won awards for its work at Tata steelworks in Port Talbot and Monmouthshire Housing Association. Among Dawnus’s other projects in Wales are the £5.6m Roath flood risk management scheme in Cardiff , Bont Evans tree works and stabilisation in Machynlleth, Powys, and St Asaph flood defence works, Denbighshire. In Powys, Dawnus Construction has contracts to build three new schools – two new primary schools in Welshpool, and a replacement for the county’s first all-through school Ysgol Bro Hyddgen in Machynlleth. One of the primary schools is scheduled for completion in September while the other two projects have not yet started work. “The council has not received any formal contact from the company. Dawnus is a key partner in a number of our school modernisations projects and we will be working to mitigate any potential issues which arise,” said Councillor Myfanwy Alexander, cabinet member for learning and Welsh language. Meanwhile, businesses in Swansea said they were concerned about having a building site remaining in the city centre. Mark Hanford, co-owner of of Boosh Salon, said it was “disappointing” that there will be “more disruption” to the area. “Any business in Swansea has already taken a hit,” he told BBC Radio Wales. Mr Hanford added that although he has contacted Swansea council, there had not been given any reassurances about the future. David Price, finance editor of Construction News, said there had been rumours Dawnus was facing trouble after reports of losses. “In 2014-2015 they made significant losses of around £13m, connected to work in Africa, and they have struggled to recover from that since then,” he said. The company also reported a loss of £1.4m last year, according to Mr Price.